Note: Some pilots have decided that this antenna is a good option for use with an ELT in a sailplane. Metal and carbon fiber sailplanes are difficult to mount antennas in because they block radio signals. A few customers have mounted this antenna in the glider cockpit with the antenna mounted so that it is oriented vertically and has a good view of the sky. It isn't a perfect antenna for that application because ELTs transmit on both 121.5 and 243.0 MHz. This antenna is not designed for the 243.0 MHz range. But since that is a multiple of 121.5 MHz it will probably work OK. I can't recommend it for that application because you want a very good antenna in an emergency situation such as when an ELT is used. 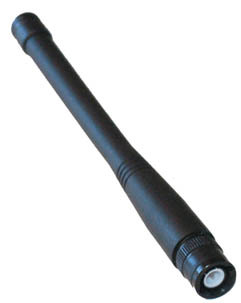 This antenna was designed for use with a handheld radio. I can make antenna cables with a variety of adapters. Let me know what you length and connectors you need and I'll make it for you. I have invested in all the necessary crimping tools.